They picked Burg for a reason, they needed a distraction, for future major attack against WG. They needed someone credible to destroy their(empty) base and someone from WG(CP0) to notice that. So that WG would be on low alert during Reverie. It is that simple. 1, burgess went above and beyond the call of duty, he deserves the BB equivlent of the MOH. Ir at least the bronze star. He was at deaths door and still decided to find weapons. Sabo could of never predicted burgess would do anything other then call for help to escape. Also, i think burgess chose a random ship. 2 cp0, they had no way to know cp0 would be there. 3 that is a massive.....MASSIVE risk they took seeing as sabo was at the base when burgess called for BB. The BB pirates said they went looking for burgess at DR. If instead of log poses.... if they used a vivi card they would of been following burgess the whole time, sabo would of been killed. Burgess "quicky, come to me and bring doc Q, also tell the captain if he attacks here he can get weapons"
Sheilliw "hey you will never believe this, but i am actually like 10 mins from you. Weird right?" I am not saying you are wrong, maybe the RA knew cp0 was spying on them? But that would make cp0 look really stupid. Maybe the RA chose to allow cp0 to find them, but the ra would have fallen for an obvious trap. And why would cp0 chase off the bb crew? If it was such an obvious trap there surely would be no evidence left. I think this is going to go down as the biggest plot hole we never get an answer for. 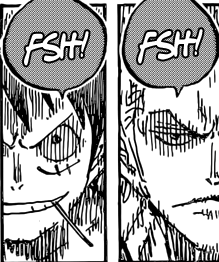 Luffy "so you are the guys who chased off BB who was destorying dads base"
Cp0 "yep, we intercepted a call from Burgess and rushed to get the weapons he was talking about? Luffy "but you chased them off?" Luffy "how did BB beat you there?" Cp0 "what.....what do you mean?" Luffy "well you guys are a massive spy organization with oppertives all over the NW, and BB is just one guy who was probably not even in the area"
Cp0 "ya....well....... why dont you shut the hell up!?" Sanji/Oven and Luffy/Holdem which one of them had the bigger distance? Luffy and Sanji both displayed the same speed. Or was Sanji better? I dont know whats happening here but it seems that both speed up at the same time. Zoro into the other direction. Edited by Enbima, 13 September 2018 - 10:54 AM. We can't really compare oven with Holden yet as Holden as not shown any capabilities. All I know is that oven was at worst top 7 right after the sweet commanders, perospero, daifuku and snack. I don't see oven being one shorted by a G2G3 Luffy and Holden just did.Don't forget that in opverse your overall strength might reflect your speed and reaction capabilities. I will restrain myself of saying anything else as next week chapter might prove me wrong. Edited by Fulmine, 13 September 2018 - 11:53 AM. But should comparing Oven and Holdem really matter though? I think the main question was whose speed feet between Luffy and Sanji was better or whether they're the same, which I'll agree to that. Why do you think the speed isn't the same? Just wondering. For a man to stand up again, he needs one thing...to make excuses. Sanji-Oven has a distance not longer than 50m, I think, so is Luffy-Holdem. And the former's situation is a bigger emergency (Oven is about to kill Pound. Here Holdem didn't kill Tama yet) which means top speed was absolutely needed and indeed Sanji's thought said he would move so fast no one could perceive. Oda confirms Sanji is faster than Luffy in a 50m race in SBS which would make it ridiculous if Sanji's ''Soru'' speed would lose to BaseLuffy's speed. Actually even without the SBS I think Sanji's speed should be comparable to Luffy's Gear2 at least. I also consider Oven a better fighter than Holdem (and the lion) from the look of things so far. The only similar thing between these 2 situations is the visual representation, which is both Emperor crewmembers were blitzed without seeing it. Though like I said Oven didn't pay attention to Sanji originally so there's that. Okay fair enough, i can see what you're trying to say.